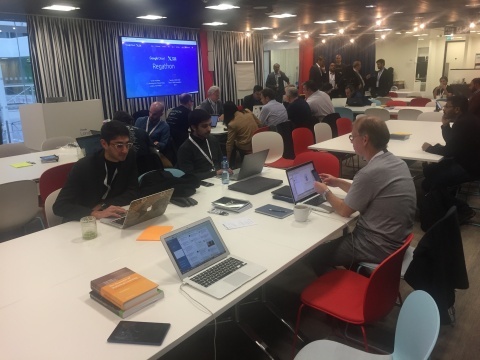 SETsquared Surrey member, Ariadne, came third in the recent Regtech Hackathon at Google’s labs in London. They were only beaten by Credit Suisse and Lloyds Bank, not bad for a startup! The team, consisted of Ariadne CTO Michael Bateman, Surrey University students Doddi Elgabry, Adrian Coutsoftides, Alexandros-Dionysios Vavvas and Ariadne’s CEO Charles Brewer. It had been assembled thanks to SETSquared organising an introduction between Ariadne and the Computer Science department at the University of Surrey. The environment for the solution of the problems included a database residing on Google’s Cloud and Virtusa’s APIs which gave access to a range of capabilities. The team discussed the problems and then designed solutions for each one. Some of these involved complex analysis of the business problems – such as identifying AML anomalies – while others were primarily technical – such as finding effective methods for disguising the identity of account holders.